EghtesadOnline: Tehran’s equity traders faced concerns, as they began the second month of the year with three days of straight losses. 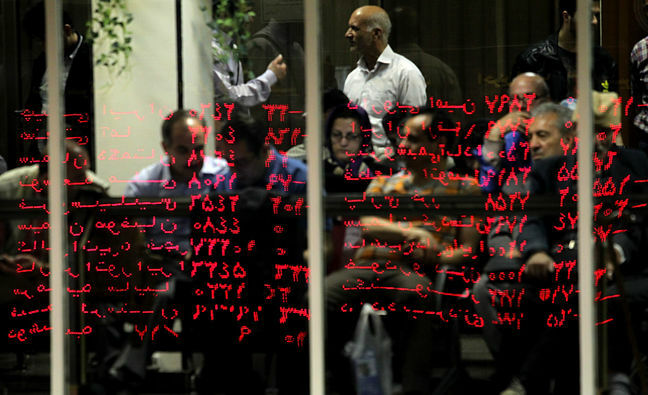 However, Tehran Stock Exchange and Iran Fara Bourse rebounded midweek over a newfound optimism regarding the fate of the Iran nuclear deal, as well as promising corporate reports. Overall, TSE’s main index TEDPIX lost 728 points or 0.8% during the week that ended on April 25 to close at 94,796.1. Iran Fara Bourse’s benchmark index, IFX, dropped 3.1 points or 0.3% to stand at 1,060.7, according to Financial Tribune. Last week saw French President Emmanuel Macron embarking on a mission to the United States, trying to persuade US President Donald Trump to stay in the landmark 2015 deal, otherwise known as the Joint Comprehensive Plan of Action. Angela Merkel, Germany’s chancellor, was also expected to use her separate official visit to Washington to urge Trump to stick to the accord he has threatened to withdraw from on May 12. Both seemed like positive signs for JCPOA, boosting investors’ confidence and causing stocks to rebound. Meanwhile, large-cap companies, such as flat steel producer Mobarakeh, reported solid upticks in sales for the first month of the year, which intensified the indices’ growth. However, as the trading week closed, further developments were less than stellar. “My view–I don’t know what your president will decide–is that he will get rid of this deal on his own, for domestic reasons,” Macron told US reporters in Washington on Wednesday. He described changes in US stance on world issues as “very insane in the medium to long term”, according to the Guardian. Macron’s remarks seem to be an indication of his failure to sway Trump. Iran, meanwhile, has said it will not accept any alternative deal–what Trump is pushing for–and threatened to resume nuclear activity if the current agreement is scrapped. The US dollar was officially out of the game last week, as the unified enforced rate stayed in place. No official foreign exchange trade took place on Ferdowsi Street, Tehran’s forex trade hub, as bureaux de change are still barred from trading. The Iranian government’s new currency of choice, euro and Bahar Azadi gold coin recorded healthy fluctuations, although in two different directions. The benchmark gold coin lost 2.65% in value last week to 17.23 million rials. It followed a losing trend all week, save for Thursday trade as the slight uptick prevented closing at the week’s low. On the other hand, the rial lost 2.11% against the European currency for the week, according to Tehran Gold and Jewelry Union’s data. It was quoted at 69,180 to the rial by Thursday’s close. Over 4.06 billion shares valued at $226.1 million were traded on TSE during last week. The number of traded shares and trade value grew by 113% and 119% respectively compared to the week before. TSE’s First Market Index lost 331 points or 0.5% to end at 67,295.9. The Second Market Index also dropped by 2,522 points or 1.2% to close at 202,089.4. And at IFB, over 853 million securities valued at $176.5 million were traded, with the number of traded shares growing by 11% while trade value dropped by 18% compared to the previous week. IFB’s market cap lost $105.7 million or 0.3% to reach $35.65 billion. Its First Market witnessed the trading of 37 million securities valued at $1.52 million, indicating a 37% and 45% downtick in the number of traded securities and trade value respectively. About 367 million securities valued at $23.4 million were traded in the Second Market, with the number of traded securities and trade value rising by 9% and 68% respectively week-on-week. Over 6 million debt securities valued at $123.1 million were also traded at IFB, dropping by 26% and 30% in the number of bonds traded and their value respectively. Exchange-traded funds were also down 8% in trade number and 19% in value to reach 21 million worth $7.47 million. Housing mortgage rights’ trade reached 40,000 securities worth $5.6 million, marking a growth of 55% and 50% respectively.